Local, National and International removals. We are fully insured and take pride in doing a good job. 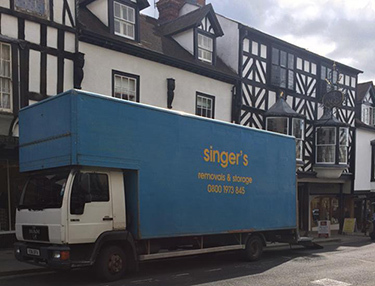 We specialise in piano, antique and fine art removals, full or part packing services available. Building our reputation, we make every move individual and tailor made to suit your needs. They have several locations around Staffordshire, here are the numbers for your local contact. Their van doing a removals in Ludlow. A team member wearing the company uniform. "We are not permanently closed and Since Mr Singer Passed away we are up and running again, re registered. Office opening times 11am-9pm and removals from any time. " "Excellent...turned up at the time agreed. Polite, friendly and very efficient. Work was carried out with minimum fuss and nothing was too much trouble. 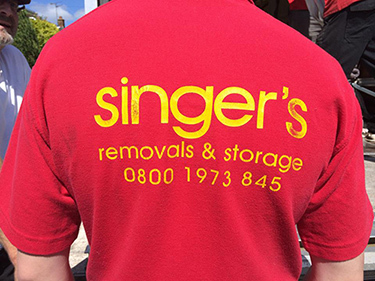 I would definitely recommend Singers Removals for service and price. July '16"